Rangers midfielder Lassana Coulibaly is having a scan on the thigh injury which forced him to miss Thursday’s Europa League clash in Maribor. READ MORE - Who will Celtic and Rangers face in the Europa League play-offs? 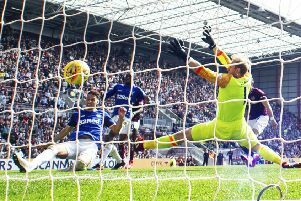 The on-loan Angers player dropped out with a thigh injury before Rangers secured a goalless draw which set up a play-off against Russian side Ufa. Manager Steven Gerrard, whose side face Kilmarnock at Rugby Park in the Betfred Cup on Sunday, said: “We will find out more today. He has got a scan just to check the injury out as a precaution. We don’t think it’s a serious problem but he’s an important player for us so we want to check it out just to see if there is any damage in there.